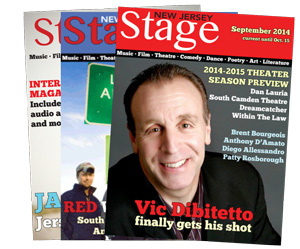 New Jersey Stage Magazine has been called the "most exciting thing to happen to the arts in years!" It has the look and feel of a traditional magazine, but the pages come alive with the use of audio, video, and interactive elements. Each issue is available for free at www.NJArtsMag.com and can be read on any PC, tablet, or smart phone. Our pages still turn, but the use of audio and video allows us to tell the story behind the story. Instead of simply writing about a musician, we can let you hear their songs or watch a music video. We can take you backstage of a theatrical performance or show a comedian actually performing their stand-up routine. New Jersey Stage is designed for the mobile audience. You do not have to zoom in to read our text, it is designed to be easily read in whatever medium you choose to use. If you have had problems with "digital magazines" in the past, chances are that is because the publications weren't true digital magazines -- they were print publications converted to digital. We are designed for digital and that makes a huge difference. Our magazine takes advantage of the power of social media as well. Articles and entire issues can easily be shared across Facebook, Twitter, LinkedIn, and Google Plus. In essence, New Jersey Stage merges the best features of the Internet with the look and feel of a magazine. We believe its design brings out the best for the reader as well as for the advertiser.